So I got tired of the endless war and slaughter being reported on the BBC, and thought, I wonder what’s happening on Coast to Coast? What’s happened is that the show I used to love is dead. More accurately, it has turned into just another conservative talk show. Sure, Art Bell had his own libertarian streak, and I didn’t always agree with him, but I don’t remember him ever leaning this heavily on politics. The new host (at least the one I heard that night) and his callers pretty much engaged in an hour of the most tired, predictable kind of Obama bashing, even with a few Obamacare jabs thrown in. Hey, they have the right to their opinion, but if I wanted to hear that sort of thing, there are about a gazillion other radio shows like that on the air. To my amazement, the hour ended with words of high praise for John Hagee…and when I researched a little further, I discovered that religious right pastors have been regular guests on the show lately. I realize that it’s only natural that the personality of the show changed when Art Bell left. It’s just that I feel the way a conservative Rush Limbaugh fan would feel if they turned on the radio and discovered that Rush had now turned into a home improvement talker, and a crappy one at that. The essence of the show is different. Coast to Coast used to be an eerie nighttime journey into the paranormal. It was a unique kind of programming, and it stood out. Now, it sounds like everything else out there. I haven’t done a Snowden update in a bit, so here’s some rare video of a meeting between him and Putin. They even shared a little kiss. On another note, I would really prefer it if Putin did keep his shirt on. I love complaining about whatever the media obsession of the moment happens to be, but I love it even more when I can dig up something meaningful hidden behind all the hype. A couple days ago, my PMS-inspired bitchfest focused on Royal Baby Madness. The Madness continues, as the news outlets now breathlessly report on the baby’s first meetings with each of his relatives–I’m sure they had a lot to say to each other–including Prince Harry. Ironically, the articles about Harry mention something genuinely interesting. And it’s not “How crazy of an uncle will Harry be?” No, it’s Prince Harry’s charity Sentebale, which currently has an exhibition of photos on display in London showcasing its work. 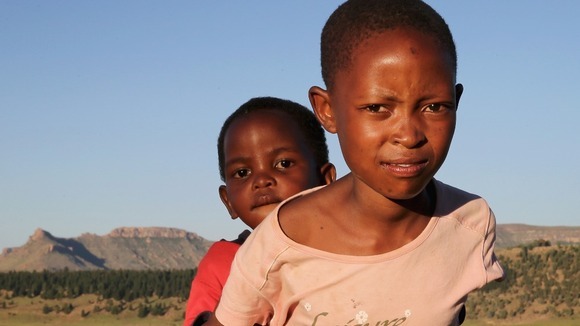 Sentebale is devoted to helping the most poor and vulnerable children in Lesotho, many of them either living with HIV/AIDS, or orphaned by it. Lesotho has the third highest prevalence of HIV/AIDS in the world. The charity works on providing the children with health care, educational and emotional support. Now here are some kids which did not have news cameras waiting outside the door when they were born, and they will not be celebrated by the talking heads as they struggle to continue their lives. Yet they are just as beautiful and royal as any child. Sentebale means “forget me not” in the Lesotho language, so let’s not forget about the other babies. Normally I’m sad about the impending death of newspapers, but in this case I’ll make an exception. Here I thought that the hard copy newspaper was going out of business due to online competition and our shortening attention spans. If Rupert Murdoch is trying to tell us that the newspaper companies are actually going kaput because they’re full of dishonest slimebags who give bribes, hey, good riddance. But I have the feeling that it’s just this particular company, because, well…Rupert Murdoch. Interesting, by the way, how I never heard the kind of uproar on right wing radio about this phone hacking scandal that I have about the recent NSA one. Wasn’t this just as much of an invasion of privacy? Clearly, this kind of thing is VERY BAD when the government does it, but only meh when a giant corporation does it. Or is it just that Rupert doesn’t have an African last name? For the record, I’m angered by both hacking scandals, but it’s always fascinating to see the talking heads apply their double standards. If only Obama had been involved somehow…. As we continue to grapple with the dilemma of Prism and the NSA observing our lives (or perhaps not–I haven’t heard too much discussion of this lately), the problem of privacy vs. security continues world-wide. Great Britain has now announced that it will opt out of over a hundred EU regulations, at least for the time being. One of those new laws has to do with creating a single European DNA database. On the surface, this sounds good–it will make chasing after criminals across the borders of EU countries easier. On the other hand, here is yet more opportunity for possible abuse of power, and a single institution having access to a lot of information about its citizens. Also–and this is what Britain is balking at–it means additional chipping away at the sovereignty of individual countries within the EU. Especially in connection with something called the European Arrest Warrant, which would allow any EU country to demand the deportation of an accused criminal from a different member country. Britain says it wants to consider its options before agreeing to these regulations, and I’m thinking it is probably wise to do so.